Do you love indoor trampoline parks or want to try something new and exciting? Then these Black Friday and Cyber Monday deals at Sky Zone Tampa in Brandon will have you literally jumping for joy! As gifting experiences are becoming more popular, Sky Zone Tampa’s Black Friday and Cyber Monday deals also make awesome holiday gifts for your family and friends. Whether you jump on these deals for yourself or for your loved ones, though, you can’t skip over these amazing savings at your number-one indoor trampoline park. 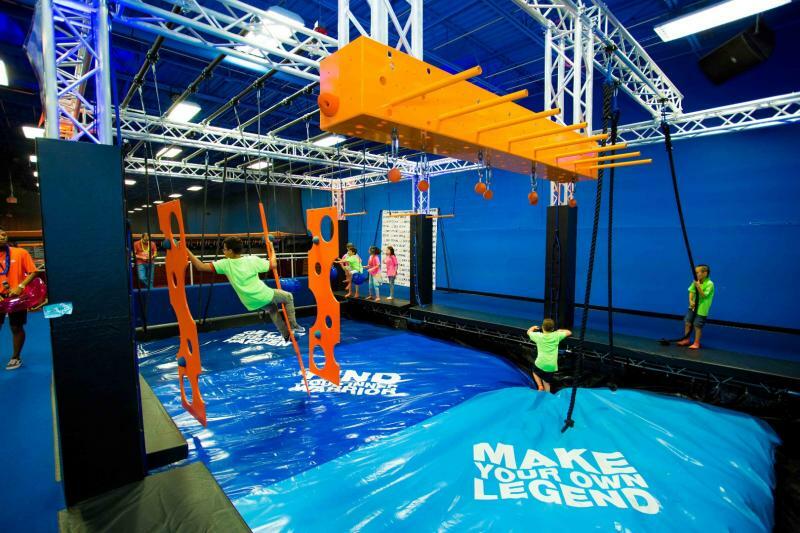 Black Friday has always been known for insanely-good deals, and Sky Zone Tampa is dropping a few of their own the day after Thanksgiving with Annual Passes, $100 off birthday parties, and Holiday Gift Card Bundles. Get the most blast-offs for your buck with their Annual Pass that you can use all 365 days of the year for 60 minutes a day, and it’s only $99- an astronomical saving! There are only 40 Annual Passes available, so get to Sky Zone Tampa at 8:30 a.m. on Black Friday and snag yours! Parents, you’ll definitely want to take advantage of Sky Zone Tampa’s $100-off birthday party deal on Black Friday for your kid’s next B-day bash. This deal excludes Toddler Time and Mini Parties and is valid one per person. A party must be reserved to receive this offer on Black Friday. Party packages at Sky Zone Tampa range from $299 to $499 and include everything you need to throw a party: invitations, paper plates and cutlery, pizza and drinks, setup and cleanup, and more! Sky Zone Tampa’s Holiday Gift Card Bundle makes a great gift for anyone, including yourself! The bundle includes a $30 Sky Zone gift card, Sky Socks, and a 30-minute Activity Pass, all for the gift card value! Whereas Annual Passes can only be purchased in-store, you can take advantage of Sky Zone Tampa’s two other Black Friday deals by visiting the Sky Zone Tampa website or calling them at (813) 833-1740. Annual Passes and $100-off birthday party deals are only available on Black Friday while supplies last, and Holiday Gift Card Bundles can be purchased through December 31. At Sky Zone Tampa, the deals keep coming on Cyber Monday with Toddler Time Play and Activity Passes. Your little one can bounce around at Sky Zone Tampa with a 10-session Toddler Time Play Pass for $99 (a $129.90 value!). The Toddler Time program runs on Wednesdays from 10 a.m. to 12 p.m. and on Sundays from 9 a.m. to 11 a.m. While school is out during the holidays, the Wednesday time will be from 9 a.m. to 11 a.m.
Sky Zone Tampa also has a couple of Cyber Monday deals on Activity Passes that you and your older kids can enjoy. You can get five 60-Minute Activity Passes for $59.99 (an $80 value) or ten 60-Minute Activity Passes for $99.99 (a $160 value)! Take advantage of this Cyber Monday deal and use your passes for a fun family outing over the holiday break. These Activity Passes would also make great stocking stuffers for other family members and friends! Toddler Time Play and Activity Passes are only available on Cyber Monday while supplies last and can be purchased online, over the phone, or in-store starting at 9 a.m. While you’re scoping out savings this holiday season, be sure not to miss out on these incredible Black Friday and Cyber Monday deals at Sky Zone Tampa in Brandon! Find more fun things to do in Tampa by registering on 813area, your free guide to everything in the Tampa Bay area.